I've been keeping this photo under wraps for a while...just never felt like it was time to share it - until now. By now, if you've followed my work for some time, you would know that I have this sort of fetish for contextual atmospheric wildlife photos taken with shorter focal lengths. I simply love the scenery of Africa too much to resort to frame-filling portraits in the majority of my image-making. 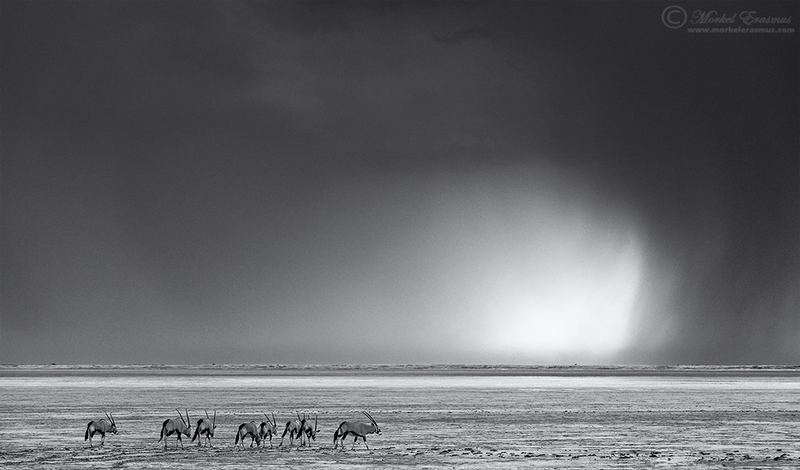 This photo shows a herd of desert-hardened Oryx, also called Gemsbok, moving across the barren Etosha salt pan as the first summer rains roll in from the distance. Etosha is a hot, harsh and unforgiving land for most of the year. However, towards the end of November a transformation happens - clouds start to form, moisture is tangible in the air, and storms start to build across the endless horizon. Water comes to this land, much needed sustenance, preserving life and keeping this fragile ecosystem in the right balance. This image is being released into my limited edition monochrome print series. It was taken with the stunning 36 megapixel sensor of the Nikon D800 and will print massively for a beautiful adornment for a home or office wall. Only 30 of these prints will ever be sold, each one signed and numbered, delivered with a certificate of authenticity. If you would like to own an edition of this print, please send me an email at PRINTS@morkelerasmus.com to discuss your custom sizing, print medium (fine art canvas or Hahnemuhle Fotorag) and obtain a personalised quote. I handle each print personally. This photo is the copyright of Morkel Erasmus and unauthorised use is prohibited.